Straw Free Arlington aims to reduce the consumption of plastic straws and other one-time use plastics in our county by enlisting restaurants to adopt more sustainable plastics policies. 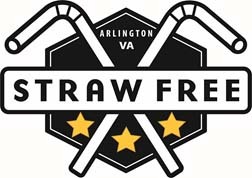 We also aim to encourage individuals to refuse plastic straws when eating out and help us convince Arlington restaurants to change their plastic straw practices. DID YOU KNOW? On average, Americans use 1.5 straws per day. For Arlington, this translates to more than 345,000 straws per day! And it is clear that the vast majority of these come from our local eateries. While made of recyclable polypropylene #5, most plastic straws are never recycled because of their small size. Those that make it to recycling facilities often fall through the cracks on sorting conveyor belts and ultimately end up in landfills where they will remain for hundreds of years or be incinerated, which releases toxic chemicals into our air, soil, and ground water. In truth however, many to do not make to our county’s waste facilities because they are often carelessly discarded and are easily carried away by wind or water. As a result, annually thousands of straws end up in our streams, the Potomac, and eventually the Chesapeake and the Atlantic where they are not only a blight on our shores, beaches and waters but also cause real harm to birds, sea mammals and fish. The power to change these facts lies with our local restaurants and responsible consumers who actively refuse the straw when ordering drinks. If you are a restaurant interested in participating, please complete our online application. If you have any questions, please contact us at [email protected].